From Underground Toys! 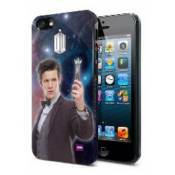 These stylish Doctor Who hard covers are designed for the iPhone 5. Durable and secure they simply slip on for easy use with a firm fit for effective grip and protection without bulk. These cases are fitted and you still have access to all touch controls and the dock connector.